Syntax Error | Ozerk from Subbody Resonance Butoh Himalaya on Vimeo. This year, we found novel way of resonance almost everyday. The way of <Dreaming Share> developped to ver.02. 1. Everybody becomes lucid dreaming mode through the conditioning 2 new version. It is simple, we are moved by someone with very slow speed into various directions. Then we can easily become subbody mode. And follow the dreaming by whole body. 2. We move to another place from the studio and continue the lucid dreaming. 3. We decide the group (A,B) and the order by lottery. 4. First person(A1) guide the other people of the group A to one's place and initiate with word or movement, A group co-create A1's dreaming world. B group support it by audio resonance. 5. Next person(B1) guide and co-create. It was amazingly interesting co-creation than ever. We got the novel way of co-creation, this wil be one of the basic of co-creation of the year. This would be develope to <Proto dream theater ver.02>, <Rhizoming share ver.02>, <Resonant Rhizome ver.02> and so on. Dark House 2 and Chimera cobody from Rhizomelee on Vimeo. Usually we go to nature on Thursday, but this week it was stormy wheather, then we shift to the school house. At first everybody found favourite place in the house, and research the subbody with dreaming. After then we exchange the place by lottery. A person was guided by another person to his/her place with blindfold, and danced there. And the first guide person started whispering his dreaming to his blindfolded partner. Then suddenly the <Blind Guide> and <Dreaming Share> merged and became one. It grew up to so interesting day as you can see the video above. This year. I stopped all planning and programing of the class, and just listened to the various Qualia of everybody's darkness of body. Then through Qualia and Qualia resonance, so many unexpected novel ideas of researching came out everyday. This would be a fortune of Non-dual. We resonated with the Qualia of the deseaster attacked north east Japan 7years ago. The largiest Earthquake M9.0, 20m hieght Tsunami, Explosion of Atomic plants and melt down, Radiation leak. It still continues to spread radiation into the Pacific Ocean. We resonated with the small creature in the ocean, when they are attacked byt the radiation, the DNA of cells mutated, and makes body malformed mutant. Each part of body is twisted, bend, shrunk and disabled. We continued to share the misery of small creature's Life every year of 3.11 Anniversary day. 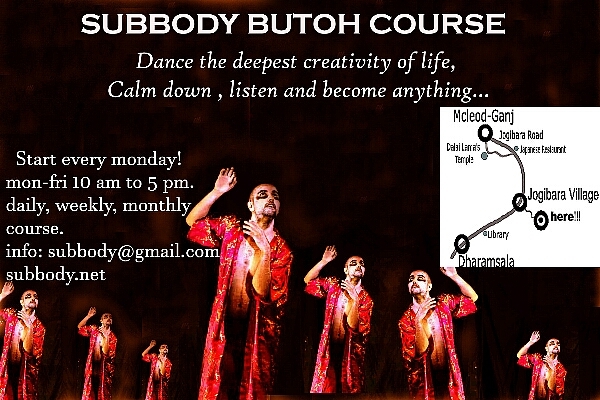 It is first or second week of the Subbody Resonance Butoh Himalaya every year. We start from the deep resonance as Life. It becomes a tradition of the Subbody school. This year some old students come back to the school, Ozerk(Turkey) after 9 years, Lisa (Germany) after 5 years and so on. I am so happy to meet them and dance together. We will continue to deepen Subbody method constantly. We have continued just dancing the Life Resonance. and now, 10,000 people are empathizing it. Also, the number of viewers is going to exceed 1 million viewers. We will deepen it further with confidence. I was trapped by an entanglement of anger, sadness, hatred and unexpressed love to my mother for long years, because my mother suddenly had disappeared when I was 3 years old. But, last Friday a sudden change happened. In the researching with the blindfold guided by Pamela in the Subbody Winter course, I remembered a tale that my mother told me. It is a story that Lion pushs the baby down under the cliff to train the baby stronger. Strangely, I could accept all experiences in my childhood as this tale. I appreciate to my parents to give me the hard challenge, and it made me tough. Last Friday I danced it in the Garden. Falling down the stairs and climbing up it to build myself. I tried to dance my unknown Anima with a small bicycle. Slowly it seems that I could be released from my infantile trauma. Himalayan Winter on Sunny days are full of Sunshine. Warm up in the sunny garden infront f 5000m Himalayas with monkies and create something new everday! It is the heaven of Life! Instead of it, we continue the work in Himalaya during the winter at the newly established Resonance Studio. I planed to write "Transparency", "The Butoh" and other books of pending issues for lonf years. I want to continue the listening to Life "What Life really wants to do". In December, Silas, guides the Winter Subbody Course as a midwife, and Pamela will do it in January and February. I began to join in it as a comfortable one participant. Suddenly my dancing spirit awakens and the brain-mind-body returns to the dancer. I had a feeling of extremely liberating freedom of creativity rising from one to the next after a long absence. I noticed that I usually gave such a happiness to the students. Anyway, unexpected emergence may occur besides the plan of writing for this winter. "Rhizome of Smoke Bug" are a sentense at the biggining of "Sick Dancing Princess" by Tatsumi Hijikata. The several lines were added by him when it was publisshed as a book. Well, here was condensed the essence of "Sick Dancing Princess". "That will be an insect on the way of Life reincarnation", an old man of his local land talked about, is the crystarized essence of the world view of Animism that was the background of this book. It was the same as "Shisha" written in the butoh scores of Hijikata's last solo "Quiet House". "The Shisha (dead) transform quietly yet infinitely." Hijikata has noticed that the infinite resonativity and transformablity of Qualia which was the greatest discovery in the history of mankind discovered in the Animism Age. "Smoke bug"and "Shisha" are similar symbol of Animistic veiw of the world. I will follow the essence of the butoh revolution that Hijikata was grapsing. 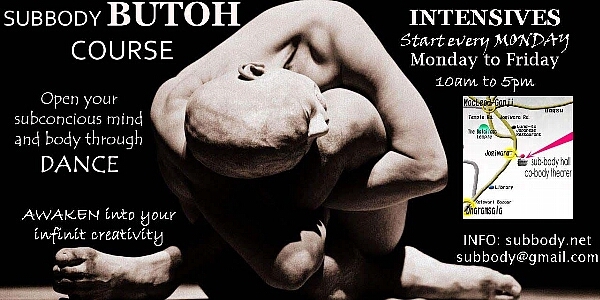 "Rhizome of Smoke Bug" is to dance the infinite transformation as a Cobody of <Resonant Rhizome>, not only solo Butoh performance. First of all, on the first day there were few audience, but we received full acclaim. In this winter, we try to vary this "Smoke Bug's Rhizome", with changing various arrangement. Let's invent devising psychosomatic techniques that will be necessary from next year. Subbody Never Sleep in Winter! Subbody Himalaya has no winter vacation. During whole winter, we continue every day conditioning, researching and co-creation. And on every Friday, we hold the Subbody-cobody theater as usual 3:00 pm- 5:00 pm. in December, Silas is guiding as midwife. Jan-Feb Pamela will guide it. Lee will join in the whole winter. It's free for long term co-researchers of 2017 and people who plan to join in 2018 March starting course. If you have time, please back to Himalaya and warming together the new Resonance studio. Next Monday 11th Dec. StartS! Himalayan winter is warm by plenty of Sunshine! You can start on Every Monday! Become Bee's swarm, Mole's tonnel! "I've been reading Deleuze's A Thousand Plataeus, and in his 2nd plataeu (one or several wolves) describing his "becoming-wolf" he describes something that immediately made me think of a free-resonance sort of creative cobody"
"I am on the edge of the crowd, at the periphery; but I belong to it. I am attached to it by one of my extremities, a hand or a foot. I know that the periphery is the only place I can be, that I would die if I let myself be drawn into the center of the fray, but just as certainly if I let go of the crowd. This is not an easy position to stay in. It is even very difficult to hold, for these beings are in constant motion and their movements are unpredictable and follow no rhythm. They swirl, go north, then suddenly east; none of the individuals in the crowd remains in teh same place in relation to the others. So I too am in perpertual motion; all this demands a high level of tension, but it gives me a feeling of violent, almost vertiginous happiness. (page 29)"
That part is what I just am going to recommend you. There is the deepest secret and mystery of subbody and cobody. I have continued to research it for 20 years. Please try to guide to that cobody to the various participants. So many rich hints, you must get. 'Mille Plateaux' is one of the most interesting Butoh text. I believe so." At the last Friday theater, Adam and cobody danced the "Becoming Wolf", and it became a dynamic <Resonant Rhizome> that everybody expanded the space and passed through with dancing. "Wow! The is the real <Resonant Rhizome>! My dream is coming true that the world starts dancing and changing to Rhizome!. A new studio is completed on the rooftop of the Subbody Resonance Butoh building. We are recruiting short weekly and monthly students each week. Short term courses are guided by the following midwives. After April : Adam, and so on. After April : Adam, Gio and so on.